There will be not much of a chronology in my blog. I’ll write about whatever I think of first. 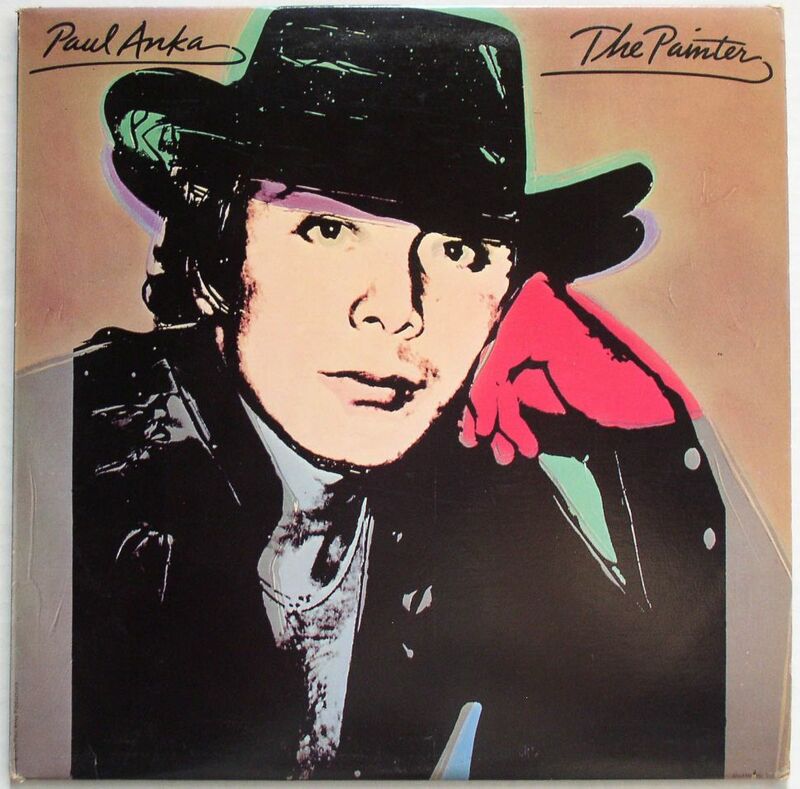 This post is about the portraits made for Paul Anka’s 1976 album The Painter. It was the first album cover that made use of commissioned portrait paintings by Andy Warhol. In the Catalogue Raisonné of paintings and sculptures, edited by Sally King Nero and Neil Printz, Volume 4, a lot of information can be found on how these portraits came to be. Paul Anka was in that time of his career a Las Vegas performer. Warhol took over 70 Polaroid pictures of Anka. Most of them with a black vaquero-type hat, but also some with a white Stetson. Anka unbuttoned his shirt, to show a lot of chest hair. On a lot of pictures he has a pearly white smile. Anka commisioned 8 paintings in total. To produce these, Warhol only used 4 pictures of Anka with the black hat, and looking serious or pensive, never smiling. Two of the pictures were used for portraits in 3 different color variations each, the two other pictures were only used once. Fun fact: on Warhol’ paintings instead of accentuating the bare chest, Anka seems to wear kind of a grey shirt. Two of the portaits were used for the 1976 LP release on United Artists Records: one on the front, one at the back. But in later years Anka managed to get all 8 portraits used in his cd releases. First there was the cd release of The Painter, according to Amazon in 1983. Well, it was not an official release by United Artists. On the booklet Anka’s own website is mentioned, and the address of his official fanclub. So it probably is a fan club release. I’m not sure in which year this happened, the cd release is not mentioned in the Discogs or Allmusic discographies. In 1996 Anka released the cd Amigos, which has all his famous hits sung in Spanish, with guest performances by Ricky Martin, Julio Iglesias, Tom Jones, Barry Gibb and daughter Anthea Anka. For the cover of this cd album Anka used yet another Warhol painting. But the remarkable thing is: at the back cover all portraits not yet used, are shown in miniature. Now that’s what one can call: money well spent. The Amigos release also produced two promo cd singles, both with Warhol cover: Diana and Yo Te Amo. Booklet and back cover of The Painter, private release. My copy was signed by Anka in 2001. On cd only: Amigos, with duets in Spanish, 1996. Promo cd single Diana (cardboard cover). Promo cd single Yo Te Amo (cardboard cover). Back cover of the Amigos cd, shows small versions of all remaining Warhol portraits of Anka. Thanks for the background information on these paintings Guy. I’m not that fond of this cover but it’s always fun to learn more about them. Always liked this cover, but why are so many cutouts / drilled-throughs?